When all the gas and dust contained in ordinary galaxies like our own Milky Way is added up, there is a puzzling anomaly: astronomers cannot find nearly enough matter for stars to form at the observed rates for long. As a partial solution, a matter cycle on gigantic scales has been proposed. In the nearby universe, traces of this mechanism had already been found. Now, a study led by Kate Rubin of the Max Planck Institute for Astronomy has found the first direct evidence of such gas flowing back into distant galaxies that are actively forming new stars, confirming a key part of this galactic recycling process. Star formation regions, such as the Orion nebula, create some of the most beautiful astronomical sights. It is estimated that in our home galaxy, the Milky Way, on average one solar mass's worth of matter per year is turned into stars. Yet a survey of the available raw material, clouds of gas and dust, shows that, using only its own resources, our galaxy could not keep up this rate of star formation for longer than a couple of billion years. Is our home galaxy currently undergoing a rather special, short-lived era of star formation? Both stellar age determinations and comparison with other spiral galaxies show that not to be the case. One solar mass per year is a typical star formation rate, and the problem of insufficient raw matter appears to be universal as well. Evidently, additional matter finds its way into galaxies. One possibility is an inflow from huge low-density gas reservoirs filling the intergalactic voids; there is, however, very little evidence that this is happening. Another possibility, closer to home, involves a gigantic cosmic matter cycle. Gas is observed to flow away from many galaxies, and may be pushed by several different mechanisms, including violent supernova explosions (which are how massive stars end their lives), and the sheer pressure exerted by light emitted by bright stars on gas in their cosmic neighbourhood. As this gas drifts away, it is pulled back by the galaxy's gravity, and could re-enter the same galaxy in time scales of one to several billion years. This process might solve the mystery: the gas we find inside galaxies may only be about half of the raw material that ends up as fuel for star formation. Large amounts of gas are caught in transit, but will re-enter the galaxy in due time. Add up the galaxy's gas and the gas currently undergoing cosmic recycling, and there is a sufficient amount of raw matter to account for the observed rates of star formation. There was, however, uncertainty about the viability of this proposal for cosmic recycling. Would such gas indeed fall back, or would it more likely reach the galaxy's escape velocity, flying ever further out into space, never to return? For local galaxies out to a few hundred million light-years in distance, there had indeed been studies showing evidence for inflows of previously-expelled gas. But what about more distant galaxies, where outflows are known to be much more powerful — would gravity still be sufficient to pull the gas back? If no, astronomers might have been forced to radically rethink their models for how star formation is fueled on galactic scales. 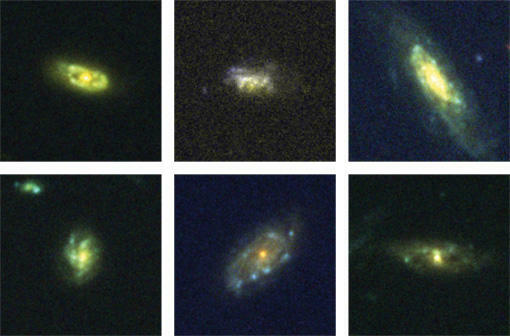 Now, a team of astronomers led by Kate Rubin (MPIA) has used the Keck I telescope on Mauna Kea, Hawai'i, to examine gas associated with a hundred galaxies at distances between 5 and 8 billion light-years (z ~ 0.5 – 1), finding, in six of those galaxies, the first direct evidence that gas adrift in intergalactic space does indeed flow back into star-forming galaxies. As the observed rate of inflow might well depend on a galaxy's orientation relative to the observer, and as Rubin and her team can only measure average gas motion, the real proportion of galaxies with this kind of inflow is likely to be higher than the 6% directly suggested by their data, and could be as high as 40%. This is a key piece of the puzzle and important evidence that cosmic recycling ("galactic fountains") could indeed solve the mystery of the missing raw matter.